Valentine’s Day is just around the corner! But fancy meals and chocolate-filled desserts can make it hard to find something romantic, delicious, and nutritious, all at the same time. If you plan to eat out on Valentine’s Day, we recommend looking at the menu beforehand. This way you will arrive prepared to order, not letting the stresses of on the spot decisions prevent you from making the best choice. Nutrition facts might not be available for all dishes at every restaurant, but making informed choices with the help of Bon'App, you will enjoy a healthier meal. Choose appetizers with lots of vegetables and try to order grilled or broiled entrees rather than those that are fried or sautéed. Finally, a great way to practice portion control is to share! Romantic and healthy! Another great way to ensure a healthy meal is to personally cook for your special someone! A lavish home cooked meal is sure to impress! For a little extra help, browse the Bon’App approved recipes on our blog or Pinterest boards. Any winter squash, except spaghetti squash, can be substituted in this squash and pepper dish that gives a great splash of Valentine’s Day color. 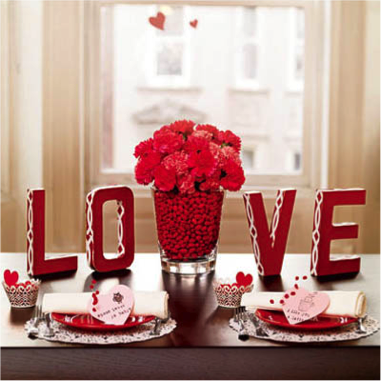 Your culinary efforts are sure to be appreciated, and for an even greater effect you can decorate your dining table with a Valentine’s Day themed centerpiece. Candles, candy hearts, or roses can create cute, fun pieces that can help make your Valentine’s meal extra special. Get cooking and bon appétit! Thank you for sharing these recipe ideas! They looks so great!